Commissioner General of the Guyana Revenue Authority (GRA), Godfrey Statia on Monday announced that tax agents would be deployed to go after businesses that cheat the 16 percent Value Added Tax (VAT) amounting to billions of dollars. 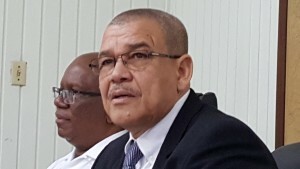 “We also have to shift our resources into the enforcement mode and go behind the businesses for them to comply so we are looking more at enforcement, compliance, investigations and further examinations so as to increase in the VAT collections,” he told a news conference that he shared with the Finance Minister, Winston Jordan. In the area of VAT leakages, he estimates that in many instances at least GYD$4 million per shipping container entering the country’s ports. “That is why you have to shift emphasis and do more post-clearance audit and more investigations and these things,” he said. At the same time, he announced that GRA has begun clearing off years of VAT refunds dating back to 2013. Already, the tax collection agency has paid out GYD$2 billion in refunds for the year and that is projected to grow to GYD$5 billion by year end. The Finance Minister said the VAT refunds were among some of the heavy financial burdens that the coalition government has inherited.